Three countries take credit for the origins of this delightfully adorable breed. English breeders provided the sturdy bulldog frame while the French-bred them down and popularized them during the Industrial Revolution. They were the favorite of ordinary Parisians like butchers, café owners, those in the rag trade and were the favorites of Parisian Streetwalkers (Prostitutes). Even famed artist, Toulouse Lautrec popularized them in a few paintings. 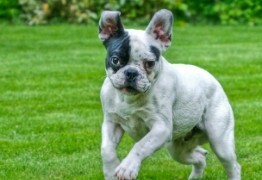 Lastly, American breeders standardized Frenchie’s with erect or bat ears and this breed has propelled from being the 76th most popular dog in America to the top 5. French Bulldogs have also taken social media by storm with groups of over 2 million on Facebook alone. It’s no secret though with all the cuteness in Frenchie’s they do have health problems many anatomically related. Glucosamine, Chondroitin & Green Lipped Mussel as well as CBD Oil for pain and inflammation. #2 Frenchie’s are flat-faced, have a short head and are a Brachycephalic breed. 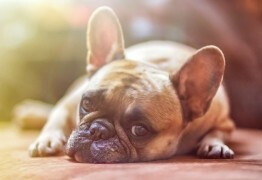 French Bulldogs might have a difficult time breathing, leading to noisy breathing, snoring and snorting. This breed may tire easily during exercise, cough, vomit or gag. 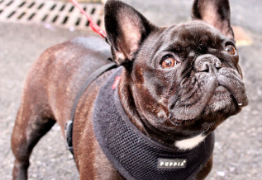 Do not over-exercise Frenchie’s especially in hot weather and always make sure they have a cool place in warm climates. Natural products like Sinu-Help or Respiratory Support are highly recommended as well as High Spectrum Hemp Oil for its anti-inflammatory benefits. NOTE- Many flat face breeds are comical and were bred to look cosmetically like people but one can wonder if French Bulldogs might of inherited the flat face physical characteristic from Bulldog ancestry where the flat face was functional when Bull Baiting. #3 Digestion & Flatulation- French Bulldogs are well-known for having digestive issues and noted as being experts in flatulating, partly due to their small head and flat face taking in too much air when eating or their sensitive digestion. To improve digestion and reduce the odor from flatulence you can try a homemade AAFCO balanced food or there are fresh foods available in stores like Freshpet or Fresh prepared foods that can be custom tailored based on your dog's needs. Companies offering fresh homemade foods delivered to your door include The Farmers Dog, My Ollie & Pet Plate. 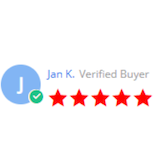 Herbal products like Good Digestion are safe and effective and clinically researched High-Spectrum CBD Oil is non -psychoactive ( Does not have the high associated with THC) has been studied for its digestive and anti-inflammatory benefits and should be used ongoing. 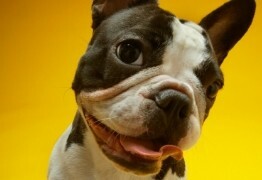 #4 Skin & Coat issues are so prevalent in French Bulldogs that they have breed specific products like Boo Boo Butter. Hypoallergenic shampoos are recommended as well as products containing Omega 3 Fatty Acids. Colloidal Silver sprays can be effective and a brand called Vetericyn makes a great anti-microbial spray for hotspots and rashes( Note, I do not believe it is natural but it is non-toxic). CBD Oil is a Frenchie Favorite to help with skin irritation. If the skin allergies are food derived an elimination diet might be necessary. TIP-Keeping your French Bulldog slim will help with arthritis, hip dysplasia, respiratory issues, and many other health issues.